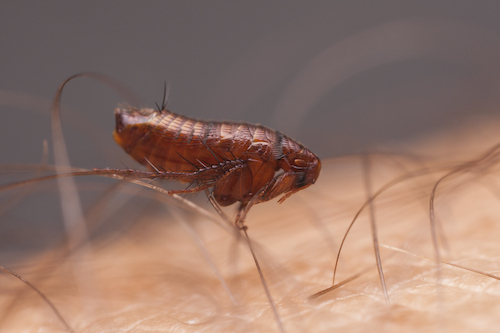 A deputy city attorney in Los Angeles thinks she contracted typhus from flea bites at her city hall office. The fleas apparently carried the disease after biting infected rats that have been reported at city hall, report the Los Angeles Times, the Wall Street Journal, NBC Los Angeles and CBS Los Angeles. Deputy City Attorney Elizabeth Greenwood became severely ill a few weeks after seeing insect bites on her ankle. She has been on medical leave since November when she experienced the symptoms: high fever, severe headache and dizziness. Other symptoms include rash and fatigue. Greenwood defends police officers in lawsuits. She went public with her disease to protect others at city hall who have not been warned of the health threat. She was first diagnosed with meningitis but figured she might have typhus after remembering the mayor’s warning in October about a typhus outbreak. Nineteen people in Los Angeles have been affected, including eight homeless people. A blood test confirmed her suspicion. The disease is not spread person to person, and it can be treated with antibiotics. Some people get well without even knowing they had the disease. Greenwood’s disclosure has led others to come forward with stories about the rat infestation. The city clerk has reported being chased from her office by a rat the size of an opossum. A city councilwoman reported seeing five rats, although three of them were dead in traps. A bad smell in one staffer’s office turned out to be a dead rat in the ceiling. The mayor said city hall has responded with increased trash collection and cleanings, and pest abatement in and around city hall. Sixty rodent burrows and 114 tree wells are being filled. Some think the demolition of a nearby building may have increased the rat population. City councilman Joe Buscaino is partly blaming a federal injunction that prevents the seizure and destruction of homeless people’s property without advance notice. Seized belongings have to be stored so they can be recovered. The Wall Street Journal noted Buscaino’s comments Friday on the city council floor.